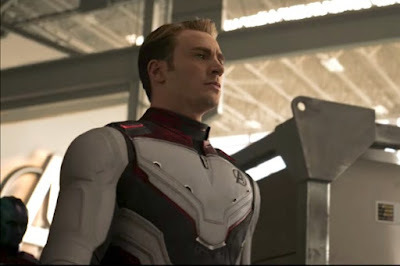 We barely take notice of TV spots around here most of the time, but when it's Avengers: Endgame, which Marvel is doing its best to keep secret, it's probably a good idea to pay attention. Not that you'll find anything too revealing in this brief footage, but it never hurt to get another remember that the most anticipated movie of the year is right around the corner. The footage also serves as a reminder of the high stakes involved. We are reminded through black & white flashbacks of the Avengers who fell in Thanos' attack, with the surviving heroes streaked in red and more determined than ever. Captain America's solemn vow to do "whatever it takes" probably isn't the most encouraging ever, he kinda sounds defeated already, but then we know he'll be getting some help from a certain box office-leading lady, Captain Marvel. No sign of her anywhere in this promo, though. Avengers: Endgame opens April 26th. How many of you plan on watching through the entire MCU run in preparation?